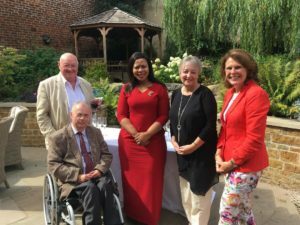 Pumela Salela, who rose from living in a one roomed home to become the Head of Brand South Africa in the United Kingdom, addressed the Rutland Biz Club lunch at The Falcon Hotel in Uppingham on Thursday 16 August. Pumela inspired attendees with her personal success story made possible thanks to a Nelson Mandela Scholarship. Her early years spent living with her family in one room with no running water or electricity, led her to dream bigger. Attendees also heard how South Africa is open for business. Pumela’s role as Country head of Brand South Africa, treats the country as a brand, offering globally competitive economic opportunities and collaboration between South Africa and the UK. Opportunities include a transformation and national development plan, strong bilateral trade deals and investment. The UK, as the country’s largest investor, has pledged £50m to take away barriers to trade as part of a deal between Prime Minster Theresa May and South African President Cyril Ramaphosa, agreed at the recent Commonwealth Summit. Strides have been made in South Africa to promote the emancipation of women with a Commission on Gender Equality, a fully dedicated Ministry for Women and employment rights for women and disabled people whose foundation is enshrined in the constitution of South Africa. Poverty is also being addressed with access to healthcare, with a new formalised healthcare system in the pipeline and basic housing where people have running water and electricity.